The N2350 is a two-bay NAS powered by a Marvell Armada 385 dual-core processor running at 1 GHz. 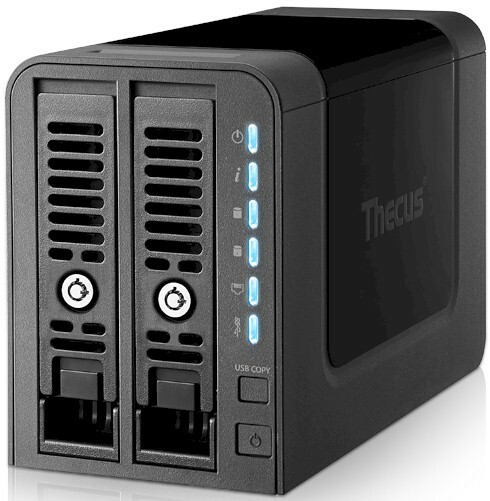 It's most likely a replacement for the N2310, [reviewed], but Thecus rarely discontinues products. The chart below, from Thecus' comparison generator, shows the N2350 has a more beefy processor, two USB 3.0 ports and double the memory of the N2310. In addition, the N2350 has support for iSCSI target and initiator - a feature that you rarely see in entry-level NASes, while the N2310 doesn't support iSCSI at all. The N2350 is currently priced around $120 - quite a bargain compared to the N2310 that still appears on Amazon for over $200. I'll be comparing the Thecus N2350 with the QNAP T2-228 and ZyXEL NAS326. Thecus's $120 price for the N2350 puts it squarely in beween the $80 ZyXEL NAS326 and the $140 QNAP TS-228. The chart below, generated from our NAS Charts, compares the major features of the TS-228 and the DS216j. You can see the full feature comparison here. The major differences, other than the processors, are the amount of memory and the number and type of USB ports. The N2350 is also the only one of the three compared NASes that supports hot-swappable drives. The callouts below shows the front and rear panels of the N2350. The front panel features lockable disk tray - a feature rarely found on entry-level Home/SOHO NASes. There is a USB copy button located near the power switch, but there isn't a convenient USB 3.0 port located on the front panel. The front panel callouts also show how individual LEDs indicate status. The rear panel has a single Gigabit Ethernet port, two USB 3.0 ports, power connector, cooling fan vent and a reset button. Not labeled is a security cable slot. The photo below shows the component side of the N2350's main board. It's interesting to note that there is a third USB port, located on the right-hand side of the board, which is not brought out to the front panel. The Table below shows the key component summary for the three NASes compared in this review. The N2350 drew 10 W with two of our stock WD Red 1 TB (WD10EFRX) spun up. Drives did not spin down after the selected time, even when logged out of the browser-based administration interface and network connection was removed. Fan and drive noise was rated low - mostly drive noise.